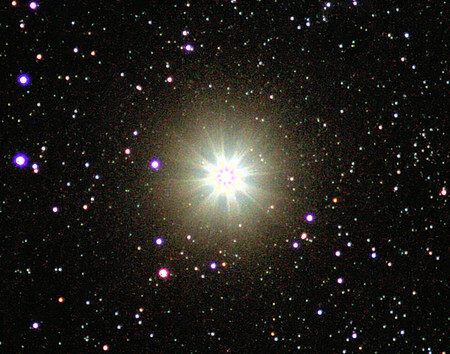 Capella is the brightest star in Auriga constellation. It is very easy to spot in the Northern hemisphere. It is a circumpolar star, very bright one. The picture has been taken through a 300mm telephoto lens and Canon EOS 450d over a Sky Watcher EQ6 equatorial mount. The Tamron SP 54 is a 300mm telephoto lens, with an aperture of 54mm. I took a 60 seconds of exposition image of M42 in Orion. A few months later I took a 15 seconds image of the same field through a 6 inches Sky-Watcher non-apo refractor. 1.- A 150mm lens gives more resolution than a 54mm lens. Stars are fainter in the 6 inches refractor picture. 2.- The light captured by a 54mm lens in 60 seconds is nearly equivalent to the one captured by a 150mm lens in 15 seconds. Nebulosity appears practically equal in brightness in the two pictures. The lower image is a full frame, meanwhile the upper one is cropped at 25%. 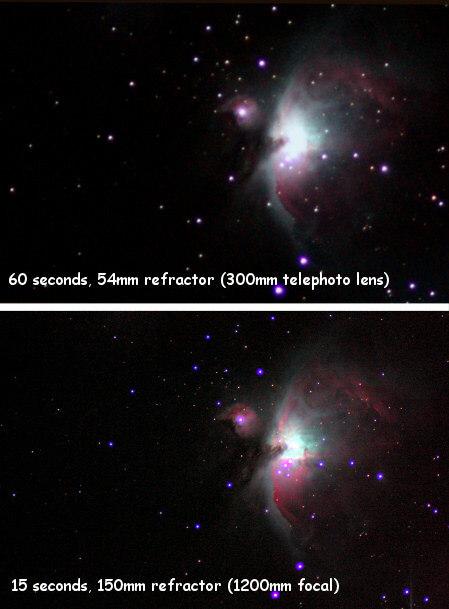 Both images were taken using an unmodded Canon DSLR camera, EOS 450D (or Rebel XTi) and an EQ6 equatorial mount. Here we see Andromeda galaxy as viewed from above. The spiral arms and structure becomes visible clearly in this processed image with a distortion nearly equivalent to a change of the observer location from our galaxy to a point in the void intergalactic space just above M31. The original image from which this perspective has been obtained was a 4 minutes exposure with a 300mm telephoto lens and a DSLR Canon EOS 450d (Rebel XTi) camera. In order to attach Tamron SP 54B 300mm telephoto lens to DSLR camera Canon EOS 450d (Rebel XTi) I used an adaptor found at ebay (Looking for “Tamron Adaptall 2 Lens To Canon EOS EF Mount Adaptor”). It works properly and it is very accurate when focusing to infinite. Pixco is the brand adaptor. Tamron SP-54B 300mm is a telephoto lens built 30 years ago, oriented to analog reflex camera market. Thanks to a special adapter for Canon EOS DSLR camera, I could attach them each other and take some shots. The field of view and the magnification are very different to a conventional lens, like Canon EF-S 18-55mm.